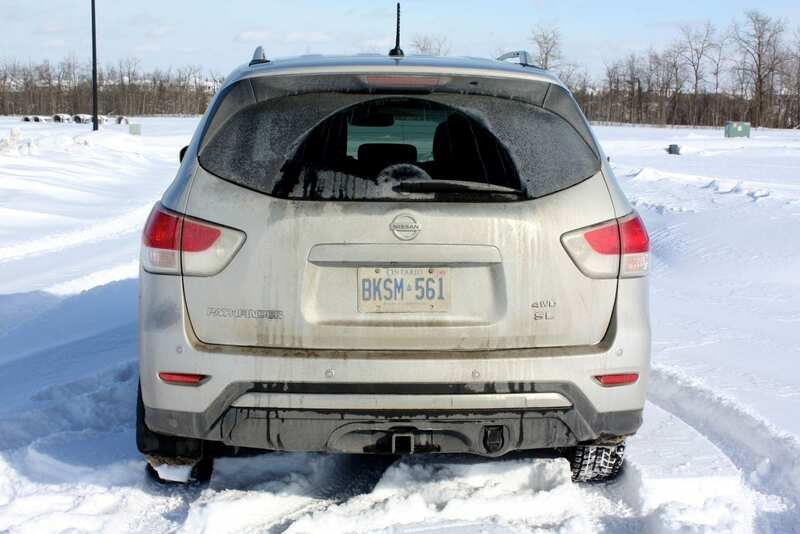 Nissan has completely revamped its bread-and-butter SUV and has knocked some of those long-lasting, truckish edges off for this all-new 2013 model. 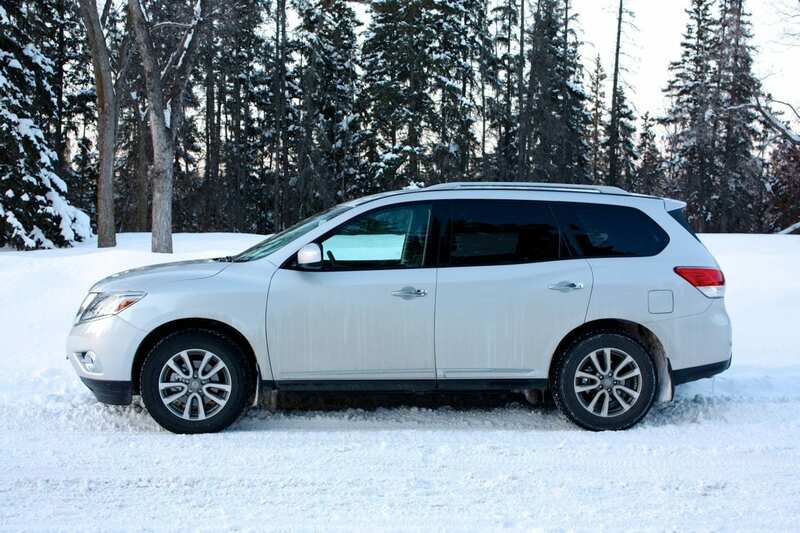 The Pathfinder has never taken the world by storm in terms of its styling. It’s always done its own thing, and had its own design cues, but it has never been avant-garde. Although it’s never set the world on fire, I’ve always liked it for its simplicity and honesty. And the all-new styling is much of the same. Although it looks like sporty in some pictures and from some angles, it’s very vanilla in real life. I found it to be a nice, unified, smooth look with nary a hint of aggression and very little of its former brawniness. The design is less rough and tough than in the past, and comes across as sleeker, more urban friendly and subjectively, less masculine. It’s a handsome design that will likely turn very few heads but won’t offend anyone either. The Pathfinder has always been truck-based, and that’s changed too. Not only does the Pathfinder’s suit no longer come across as rugged on the outside, it’s made those alterations under the cloth too. 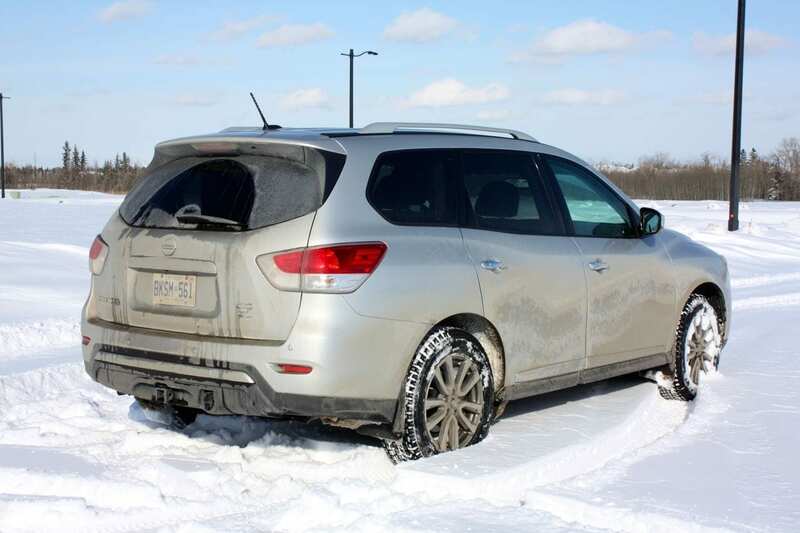 It’s now a front-wheel drive car-based cross-over. Though that will be called sacrilege by some purists, that’s actually the vehicle the vast majority of us have needed from day one. Very few of us need the ability to forge our own path off the beaten one. 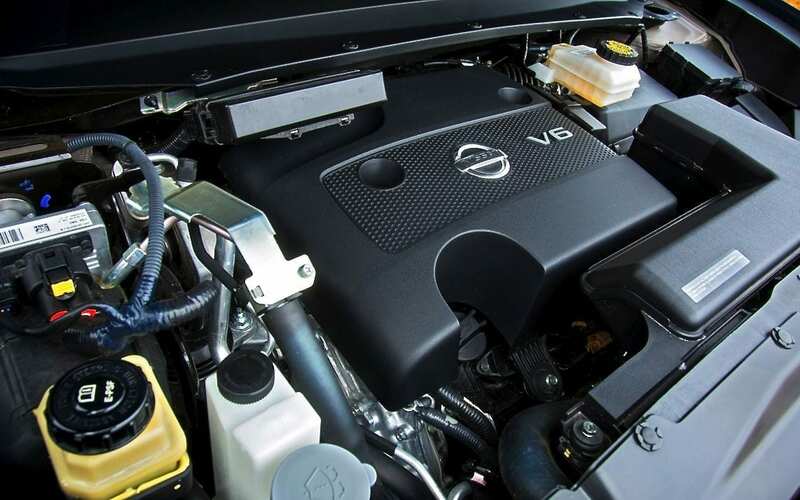 Surprise, surprise – the Pathfinder uses a 3.5-litre V6. 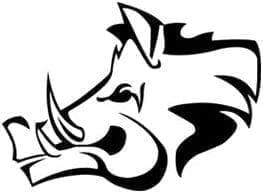 It puts out 260 horsepower at a lofty 6400 RPM and 240 lb.ft of torque at 4400 RPM. That doesn’t seem like a ton of power to drag around 4381 pounds. Nissan uses their CVT here, a fact that is also unsurprising, since we’re seeing it everywhere in their line-up. Paired with a larger, more powerful engine – as it is here – I find the CVT to be less annoying and quite palatable on a day-to-day basis. Fuel economy is rated at 10.8 L/100 km in the city, and 7.9 L/100 km on the highway. 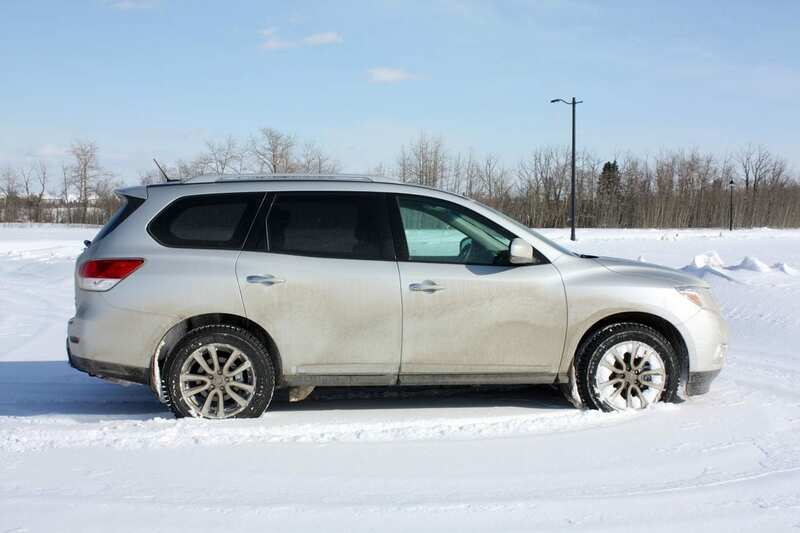 During my week with the Pathfinder, I averaged 13.4 L/100 km – quite acceptable in this class. This was achieved during a very snowy week, in mostly city driving, an occasional freeway run and with no attempt to drive economically. The tank holds 73 litres and the Pathfinder swills regular fuel, unlike its Infiniti cousin, the JX35. The interior is sculpted into pleasing, albeit boring, lines, but there isn’t a shred of soft-touch plastic on the dash or console. The dash is a vast expanse of hard, black plastic and could host a reality show on hoarding dust, which it collects at an alarming rate. 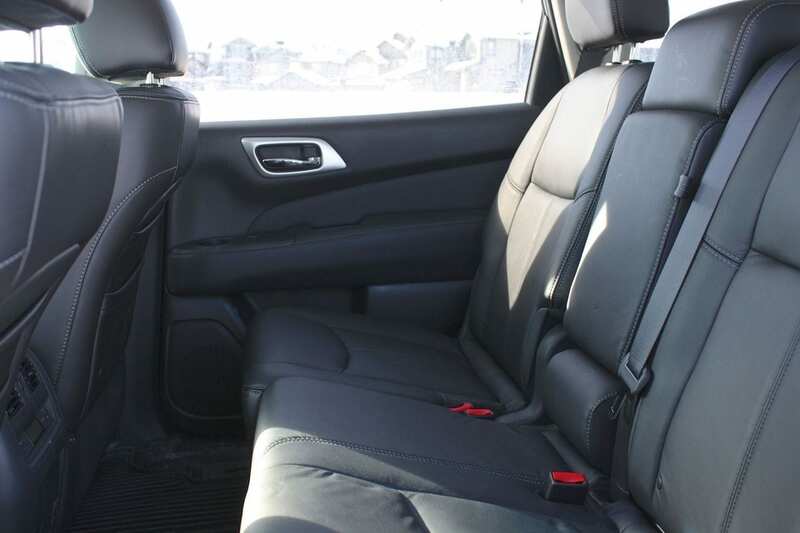 The seats, upholstered in nice leather, are power-adjustable and heated, are very comfortable. I was surprised to find good bolstering on them too. I had plenty of headroom for my 5’10” frame. 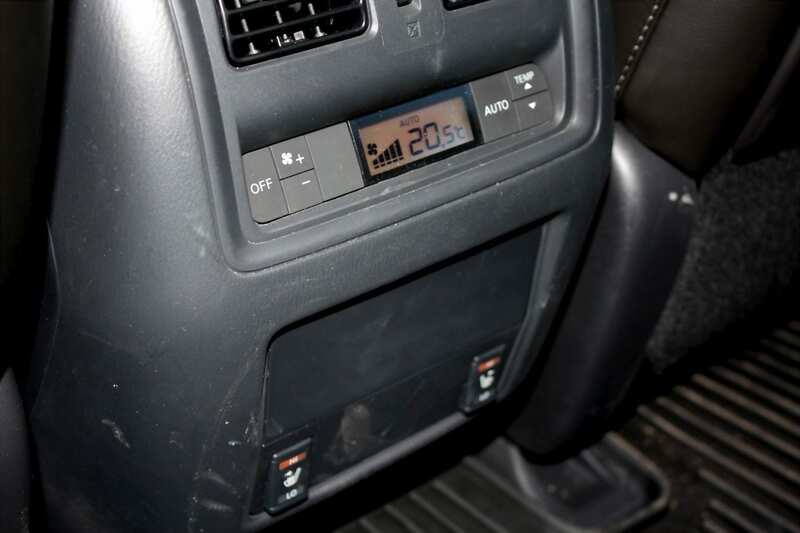 The heated steering wheel offers controls for the driver information screen, phone and cruise functions. It sits in front of two clear gauges which flank a nice, crisp driver information screen. The center stack starts with a screen on top. 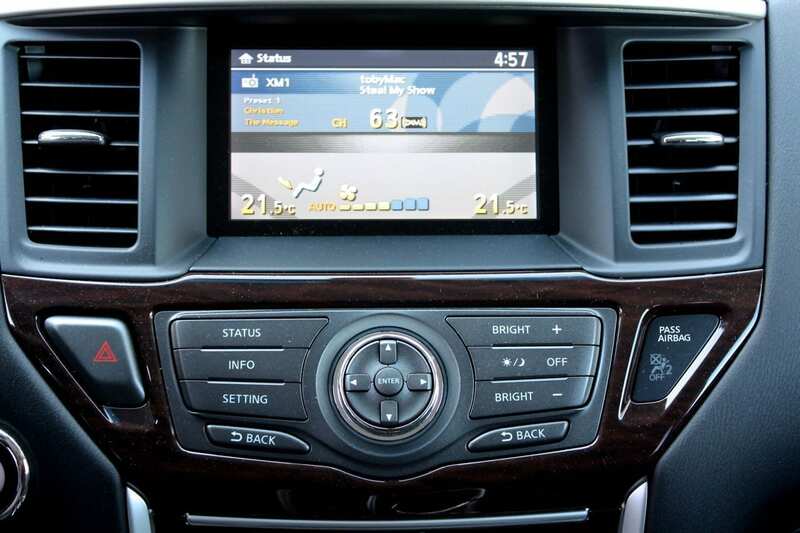 The screen handles media, vehicle settings and some fuel economy information. Unfortunately this screen doesn’t boast nearly the resolution it should. The graphics and text are significantly less sharp than on the competition’s screens. Strangely, it’s not a touch-screen, even though it’s within reach. It uses Nissan’s combination of a rotary dial and directional hard buttons to get around. After some use, it starts making sense, but it’s certainly not an intuitive interface. The screen also handles the back-up camera’s feed. Below the screen is the audio system, which sounds OK but not great and further down you’ll find a dual-zone automatic climate control system. 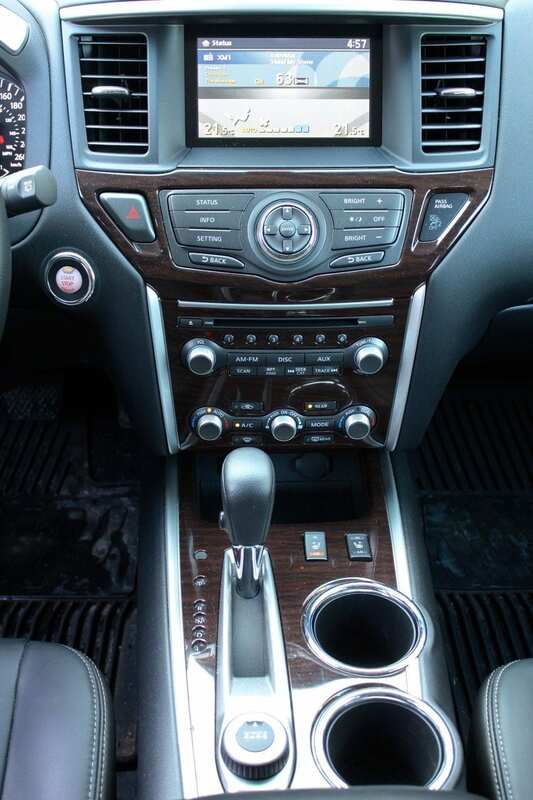 The console holds the gear selector, two cupholders and a drive-mode selector. Entry is keyless, the ignition is push-start, and a remote starter comes included. 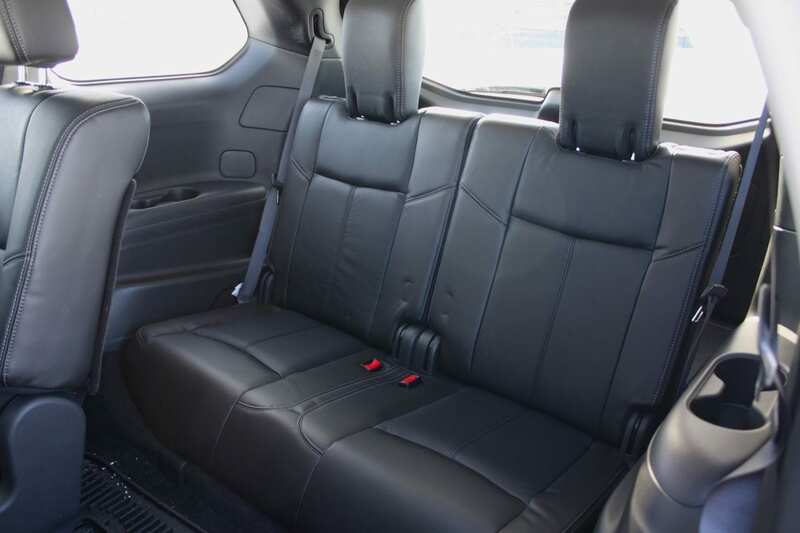 The three second row seats are very comfortable and adjustable – they slide fore and aft, recline and split 60/40. I found headroom to be quite good and the leg room was plentiful for me. In terms of convenience, the Pathfinder didn’t disappoint me here in the second row. The seats are heated (nice touch!) and there’s an automatic climate control zone for the back seats with ceiling-ducted air vents. The middle seatback folds down to become an armrest with cupholders and a storage bin, and you’ll find two seatback map pockets on each side. An innovation my family really appreciated was the excellent fold-forward design, allowing for quick, easy access to third row. As expected, the third row is a different story. The two seats are actually reasonably comfortable, and headroom was good. The leg room can be reasonable for adults, but to accommodate that, the second row needs to move forward so much that it becomes virtually unusable. Foot room underneath the second row seats is miserable for adults. The third row seats split 50/50 and there are cupholders on each side. As with most three-row cross-overs, you could actually transport seven people if the kids are banished to the far reaches of the pathfinder kingdom. There’s a nice, large open space underneath the center stack – it’s rubberized and includes two 12V plugs. The glove compartment is huge, but the door bins are a bit useless. There is a nice dual-level armrest bin – a carpeted storage tray on top, and a big carpeted bin below with the USB and 12V plugs. 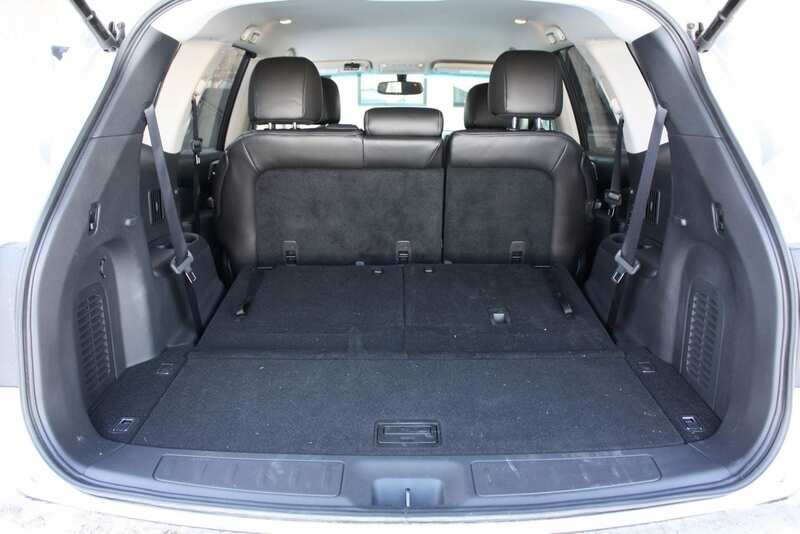 The trunk offers a good amount of cargo room behind the third row when it’s in use (453 litres) and a significant under-floor storage space (enough for a couple of small duffles). This is nice because many cross-overs make you choose between using the third row or having usable space. Of course, when you do fold that third row down, you’ll have plenty of room (1354 litres) and if you need to help move someone, the second row folds down too, giving you 2260 litres of volume to work with. The Pathfinder’s CVT, though it still hunts up and down the rev counter, is smooth and works nicely. The vehicle is very responsive off the line, and I found it to be satisfying to drive around the city. When you’re cruising along and step on it to pass, it takes at least as long as a slower automatic to get to the right ratio, but once it’s there, it feels plenty powerful so there’s no passing drama. By the way, there’s no Sport mode – just regular drive or Low – and no manual shifting of “gears”, an omission that is just fine with me in a vehicle like this. 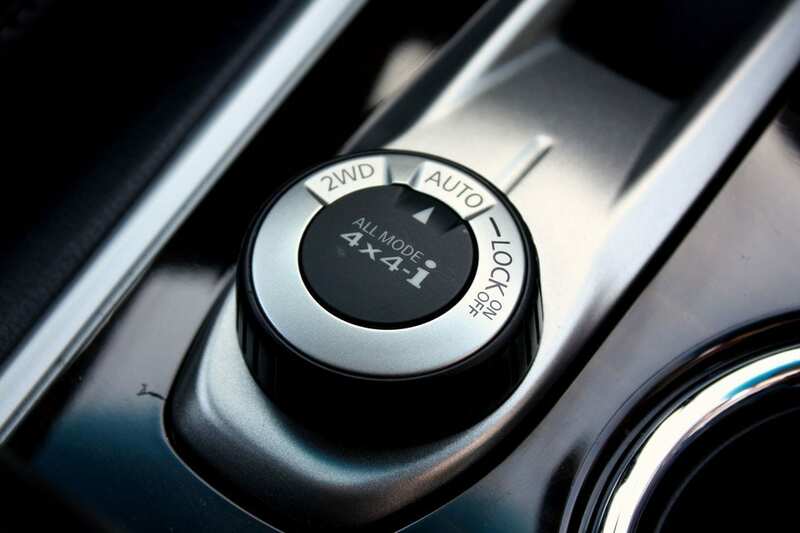 I did like the drive mode selector – it allows you to choose front-wheel drive (great for dry roads and improved economy), all-wheel drive (where the Pathfinder will determine if you need it or not) or all-wheel drive lock, which ensures it’s always on. I enjoyed the ride – it’s comfortable and soaks up big hits but never felt too soft. 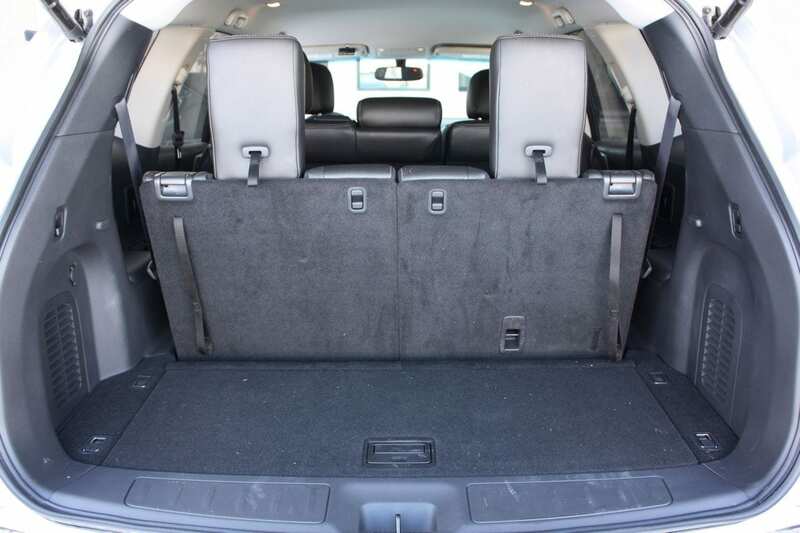 Handling is good, but I thought the vehicle felt very tall and there is quite a bit of body roll around corners – the Highlander stays flatter. And although its road manners are comfortable and always felt controlled, the steering was dead and numb. To the point of irritating me, to be honest. It’s no joy to drive, the Pathfinder, but then again, most big CUVs aren’t. The driving experience is pretty quiet, but it is not as quiet as the Toyota Highlander in terms of drivetrain and road noise. There’s a tow mode, and this vehicle included a hitch receiver and plug. 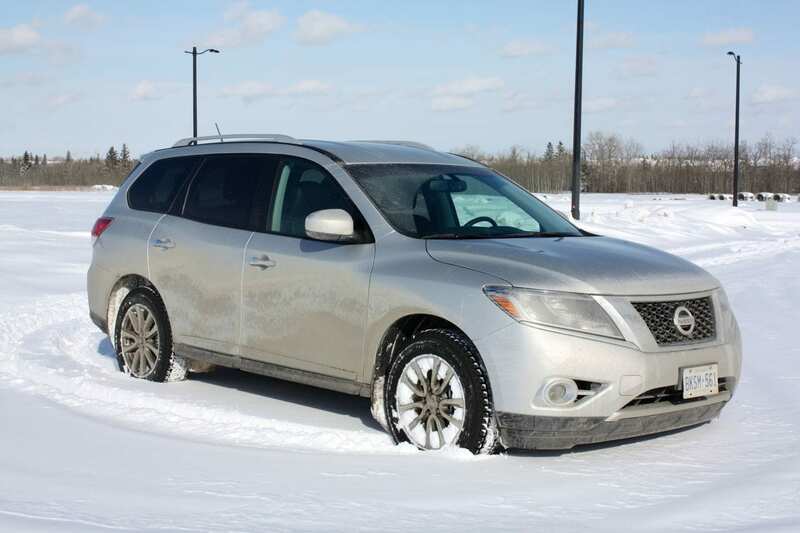 The Pathfinder can tow up to 5000 pounds, which is excellent for a CVT-equipped vehicle. Visibility is pretty good. It has a nice driving position and an excellent view of the road ahead, but shoulder checking is hampered by the humungous second-row headrests. 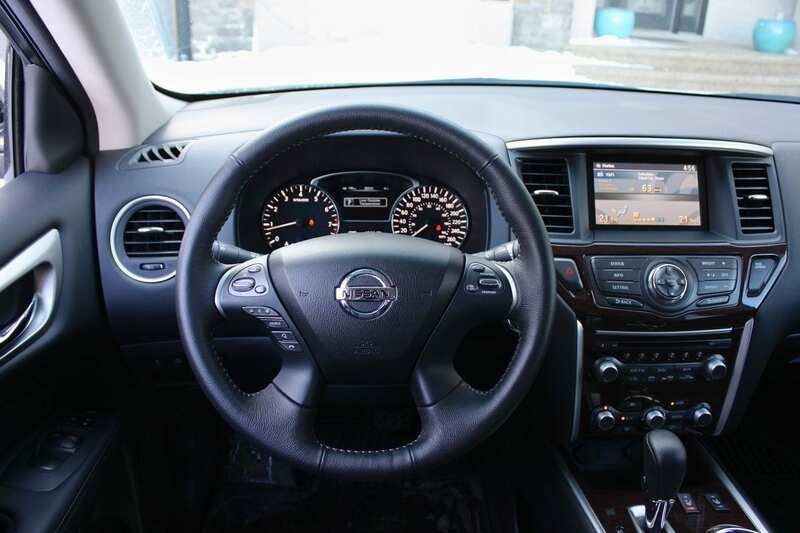 The new Pathfinder is a well put together, thoughtful and competent ride. It does a great job at what the huge majority of us would ask of a cross-over, and it felt refined while doing so. I give the Pathfinder a 7 out of 10. WAF (Wife Acceptance Factor) was not as high as I had expected. 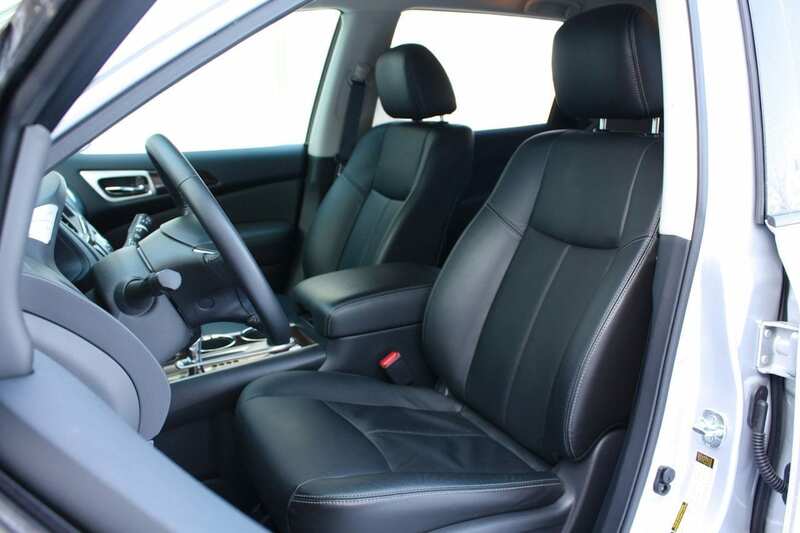 She liked the driving position and visibility, but said she never felt as in control on the road as she did in the Toyota Highlander or the Chevy Traverse. After digging, I figured out that this was attributed to the steering feel. She also said it felt a bit dark inside and had a tough time figuring out the user interface for the main screen. I thought the Pathfinder was a great vehicle. Sure, there will always be some adventure-seeking, hirsute, manly men sitting around the campfire, thoughtfully gnawing raw meat and lamenting the loss of “the Pathfinder that could”. But I’m not one of them, and for my daily trail-blazing, I prefer a decent, non-truck-based well-equipped luxurious cross-over with acceptable mileage and plenty of space inside. 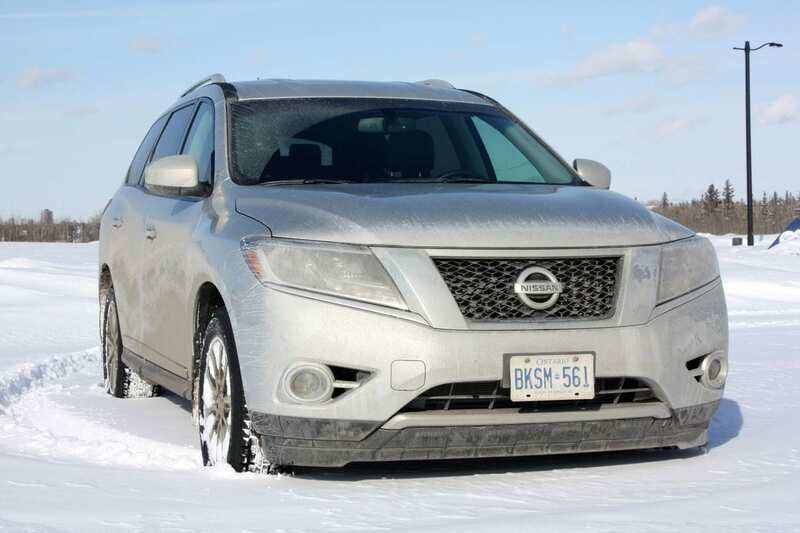 The new Pathfinder does all that – at a price that makes it seem like a very good value indeed.